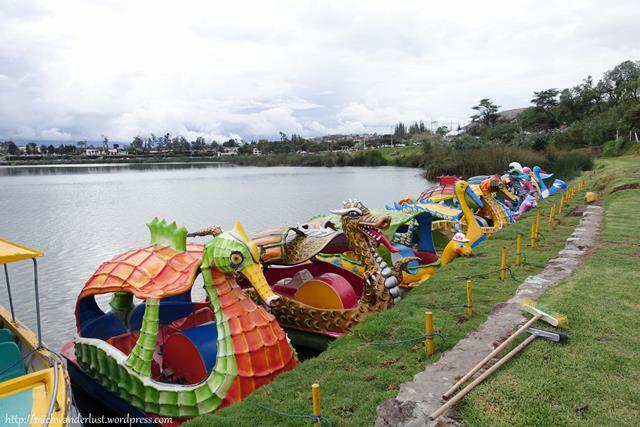 Most of the fellow travellers I meet tend to spend a couple of days, at the most, in Otavalo: visiting the Saturday market and Cuicocha Lake seem to be the most popular activities. 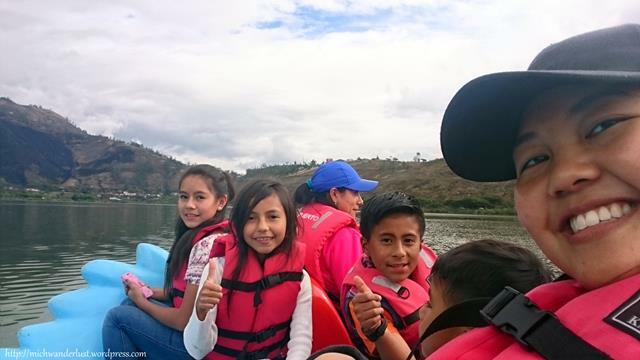 I’d already spent a week in Otavalo prior to Intag, but my host family has relatives there – in fact, the dad works as a taxi driver in Otavalo – so during the recent one-week end-of-term school holidays, the entire family decamped to Otavalo. Despite not doing much sightseeing this time around, I was nevertheless pretty happy just chilling out and catching up with friends and family (Internet – yay!). It was also good to rest because I was feeling under the weather for the first couple of days – luckily, it never turned into a full-blown flu. 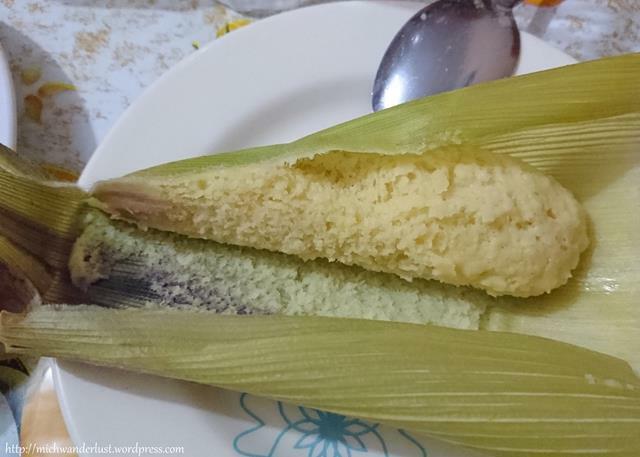 I’d eaten humitas before, but this time I actually got to help make them! As you can imagine, it’s very labour-intensive. 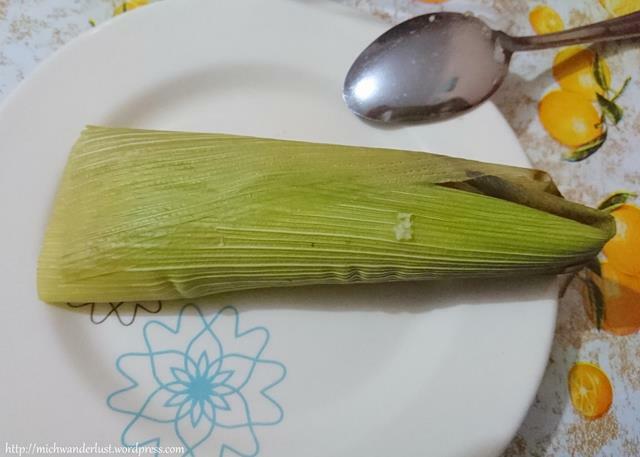 First, you have to remove all the corn from the cob. 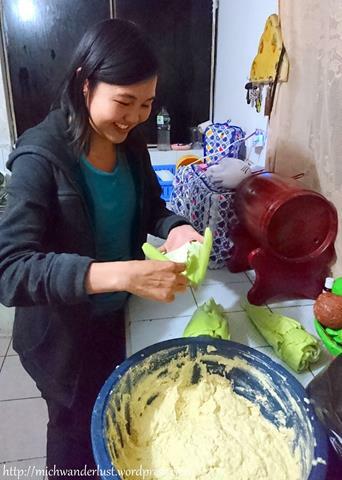 Then, you grind them into a paste – the family did this entirely by hand! 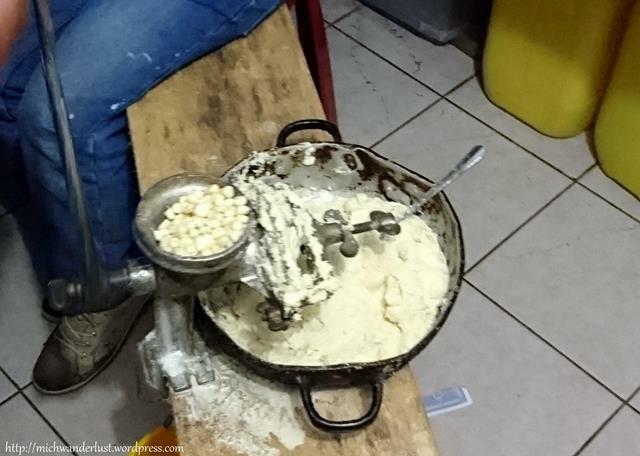 I tried my hand at grinding the corn and I can assure you that it’s really hard work. 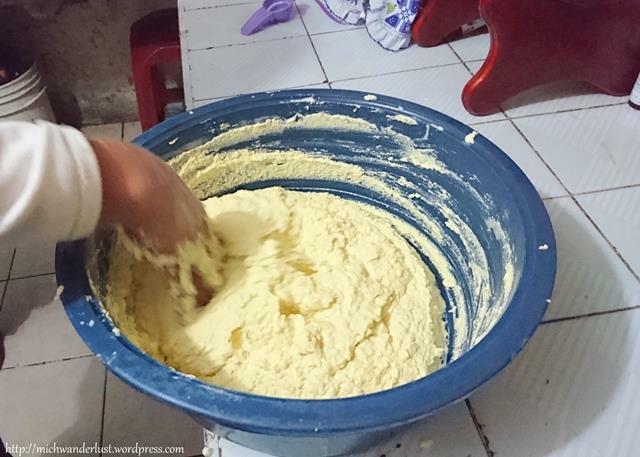 Then, you mix in the rest of the ingredients – eggs, butter, etc. I wasn’t really paying attention during this stage, unfortunately! Next, you scoop the dough into corn leaves and fold them up (hopefully) nicely. This was really fun! Finally, you leave them in a pot to steam for a bit – about 30 minutes. This particular humita was actually slightly undercooked, but it was still yummy. We made a lot of humitas and they disappeared really fast! 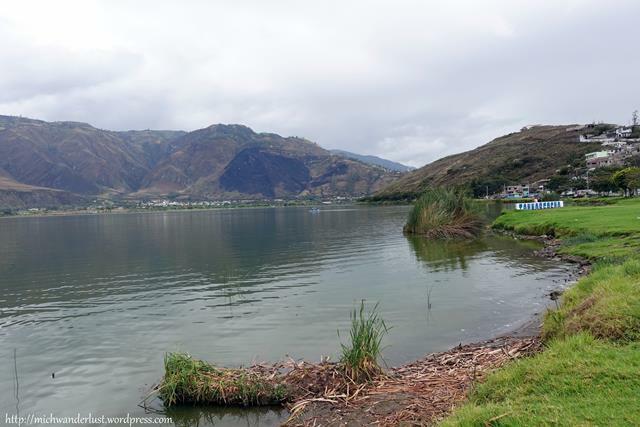 On Saturday, we went on an excursion to this lake near the city of Ibarra, which is about 45 minutes by bus from Otavalo. Getting there was straightforward, although traffic was a pain – we took a bus to Ibarra and then another bus to the lake. We had fried tilapia for lunch at the lake – this was quite a treat because here in the Andes, you don’t often get seafood. It looked really fresh too, but I’m no expert. I do know, however, that fried tilapia eaten with chopped tomatoes, onions and a bit of lime tastes amazing. I also had patacones (fried plantain slices), which I’d heard a lot about, but to be honest they were rather tasteless. They also sold coconut milk, which I adore (even though it’s super sweet and very filling. I wonder how much sugar they put in it!). After lunch, we took a bus to another part of the lake where you can rent paddleboats by the half-hour. I tried paddling but (here comes the refrain) got tired really quickly. It takes a lot of leg strength to paddle! I hadn’t been on one of these boats in years and had forgotten how tiring it is. 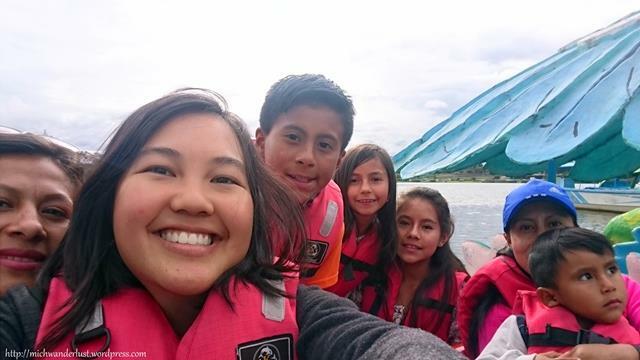 One of the top things on my to-do list in Otavalo was to visit the family I stayed with previously for a week. They were incredibly nice and made me feel right at home, but it didn’t just end when I left for Intag. The mom messaged me a couple of weeks later to ask how everything was going, when I would next be back in Otavalo, etc. I would have messaged her anyway when I arrived back in Otavalo, but it’s always nice to know that people are thinking of you! So I visited them a few times that week in Otavalo. On one of those occasions, the Ecuadorian national football team was playing Chile in the ongoing South American tournament (to determine which teams get to go to the World Cup), and we watched the first half of the game together. It was pretty exciting because Ecuador eventually won 3-0! Coming from a nation whose football team is, frankly, not very good – I really enjoyed it. I was walking home when the 3rd goal was scored, and you could immediately tell by the roar that erupted from the restaurants nearby (where everyone was glued to the TV screens). As mentioned above, the dad of my host family drives a taxi in Otavalo, and so does his brother-in-law (they all live together). Edgar (the dad) takes the day shift and Geovanny (the brother-in-law) takes the night shift. I got to accompany both of them during their shifts a couple of times, but mostly with Geovanny, because the kids often accompanied their dad during the day and it’s cooler at night! It was really interesting to get a taste of life as a taxi driver – cruising the streets over and over looking for passengers, sometimes without much success. It’s hard work, and I have a lot more empathy for them now. Sitting in the front seat of the cab was also a great way to get to see more of Otavalo and the surrounding communities – for free! I’d only been to the central part of Otavalo but it’s a lot bigger than that and there are a number of indigenous communities near the city – Peguche being one of them. No photos, because you can’t see that much at night and (frankly) I forgot. It’s a pity, but nevertheless this was a unique experience that I’ll never forget. Sleeping in a conference room! The family currently acts as warden for a taxi co-operative and so I got to sleep in the conference room (because the wi-fi signal is better there). Definitely the biggest bedroom I’ve ever had in my life! That’s a bit of an overstatement – actually, all I did was buy some condiments. As much as I like Ecuadorian food, I found myself missing soy sauce with my eggs in the morning. I also missed being able to spice my food up with a generous helping of chilli. So I bought two tiny bottles of soy sauce and chilli sauce. It’s all good! 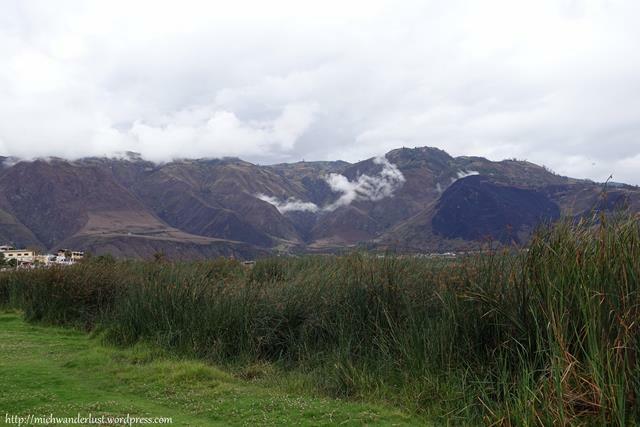 I’ve now spent over 2 weeks (in total) in Otavalo, and there’s still so much that I’d like to see – primarily Cuicocha Lake and the Mojanda lakes. I also haven’t been to the famous animal market, although I could probably live without it. This is definitely not the last I’ll see of Otavalo!